Some people wear name tags to work so you know they’re there to assist you. Other people wear an embroidered emblem on their uniform to make you aware of the company they represent. 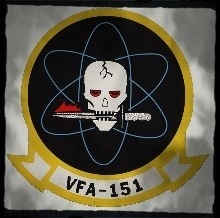 My buddy flies an F-18 Hornet for the United States Navy and he wears the pictured badge on his flight suit. Yup, totally rad.